CAMBRIDGE -- A flowered quilt dresses the big bed in the bedroom, and a cowboy quilt drapes over the wooden rocker by the fireplace in the front room. Glowing candles warm the mantle and colorful nesting bowls sit in the center of the round oak table in the dining room. All the quilts, candles and bowls in the big house are available at a new quilt and home decor shop in Cambridge. Oh, wait ... the big house IS the new quilt and home decor shop in Cambridge. Samantha Jones, co-owner of "Cottage Inspirations," said, "Being in a house lets us show people how our products and quilts will look in their own homes." 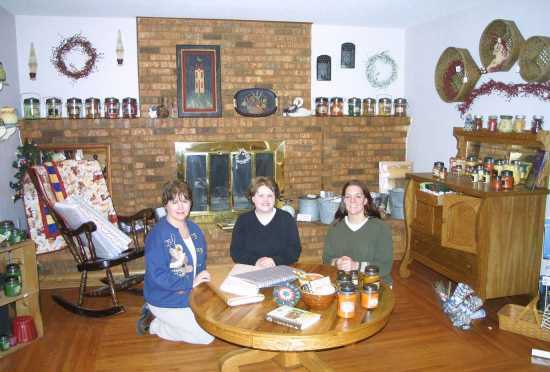 In "Cottage Inspirations," Samantha and her sister-in-law, Tobiann Jones, combined their love of home decor with Samantha's mother's love of quilting. "We put them together," said Melody Brown. "It's a good mix." The large two-story house -- mocha-colored and trimmed in a creamy hazelnut -- is located at 710 Nasby, on U.S. Highways 6-34, just 2 1/2 blocks west of downtown Cambridge, on the south side of the street. The women and their families painted, removed paneling and carpeting, changed some lighting and refinished floors before the shop opened. Tobiann laughed, "It's a good thing we know people who know how to work hammers and saws." Many people are curious about the house, Tobiann said, and, Melody added, many know people who once lived in the house, one of Cambridge's older vintage homes. The venerable house lends itself easily to decorating with shop items, said Melody, who, according to a grinning Tobiann, has made "5,000 or so quilts." The shop offers quilting fabrics, supplies, kits, patterns. "Our specialty is country cottons," Melody said, and their stock includes "Documentary," a collection of reproduction fabrics, and "Moda," a special line of designer fabrics. A favorite fabric line of Melody's is "Kansas Troubles," country fabrics created by a designer from Bennington, Kan.
Rag-time quilts are popular right now, Melody said, and the shop offers the flannel fabrics, kits and patterns. Melody plans a "make-and-take" quilt class the fourth Wednesday evening of each month, and participants will learn a new technique and take home a quick-and-fun finished product. In Saturday classes, quilters can learn more in-depth skills and/or participate in a "Block of the Month" class. Melody encourages people to inquire about special classes, and will cater her classes to all ages and levels of expertise. To complement the quilting division of Cottage Inspirations, the shop also offers "McCall's Country Canning Co." candles, "Gooseberry Patch" cookbooks and "August Moon," "Lang" and "Heartwood Creek" collectibles. Cottage Inspirations also features antique furniture refinished by Dale Wilson of Wilsonville. The shop is open Tuesday through Friday, from 11 a.m. until 7 p.m., and Saturday, from 10 a.m. until 4 p.m. It is also open on the first Sunday of each month from noon until 4 p.m., following the Cambridge Senior Center's monthly Sunday luncheon. Parking is available on the west side of the house, in the drive just off the highway.